I joined VQ in May 2016, having moved back to Chicago from Minneapolis. I had been a member of a group riding club there and wanted to continue. VQ was recommended to me, so I signed up for a class package online. When I showed up that first Tuesday evening, I immediately knew I had found a good spot for myself. I could sense the camaraderie and felt very welcome right away. This was a group that would help me push myself to improve my skills and stick with it. I switched to a membership a couple weeks later. I had been athletic and very active in high school and college, but had let it go when I got busy with work, kids, etc. I often complained that I was just too busy to get back into it in any purposeful way. Then I was laid off--or “between jobs” as I preferred to think of it--and had no excuse. I got my hybrid bike off the rack and started riding, feeling very proud of the 5-10 miles I would do on a daily basis. Before I knew it, I was riding 25-30 miles five days a week and loving how it felt. I needed that sense of purpose each day and the feeling of being productive. A friend who is an accomplished triathlete encouraged me to get some coaching and maybe even do a triathlon. I laughed and said I could never imagine being able to say I had completed a triathlon. I signed up for the Chicago Triathlon SuperSprint and will never forget that sense of accomplishment when I crossed the finish line. I was hooked! I did two sprint-distance triathlons that same summer and signed up for seven the following year. Interestingly, I was back working full-time by then, but somehow found the time to continue working out with the group. I tore my ACL the following March and was told I would be out for at least six to nine months. I had surgery that April, but held off cancelling any of my seven sign-ups as I was determined to be back as soon as possible. I ended up doing all seven! They weren’t pretty or fast, but I finished all but one. I absolutely hate running, so I never aspired to do more than a sprint since even the 5k run was a struggle for me. I found competing in triathlons to be suitably humbling as I would pass some people on the swim and the bike only to have them all catch up or pass me on the run! When I moved back to Minneapolis, I decided I wanted to do a longer distance ride. 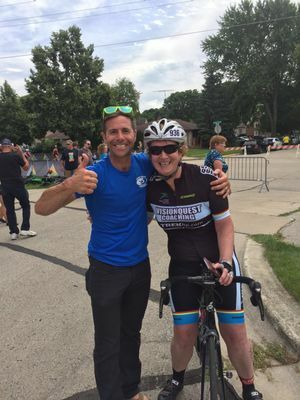 I trained by myself for RAGBRAI and decided at that stage to give up triathlons and concentrate on riding, the part I loved! Forget the awful running part! I find I love the structure and encouragement of coaching and training with VQ. This summer, I did both Madison rides and overcame my severe trepidation of climbing hills. I met some amazing people as we tackled those hills together. I also did Race the Lake, largely because Dave assured me it was mostly downhill and I would be averaging 22+ mph with the drafting effect of the group. Let’s just say I didn’t have quite that experience, nor did I finish in under five hours (but I did finish and it felt awesome!). At the end, an older woman came over and asked if I am a baby boomer. When I said yes, she asked, “Do baby boomers ride centuries?” Clearly, yes, we did and I was neither the only nor the oldest one out there. She said it was something she would love to do and wondered if I thought she should. I suggested that age is more of a state of mind and should not limit your choices--at least that’s my attitude. I am so looking forward to more events with VQ next season and am working on a plan with my coach to train during the off-season so I can be ready. Bring it on!